"It just means that women – and the men who love the women of Ireland – have spoken and they have said that times must change and they will change now," said a tearful Mellet at the Royal Dublin Society, where the count took place all day long. A crisis pregnancy for Mellet in 2011 became an important step in the fight against Ireland's constitutional amendment, which prohibits abortion under almost all circumstances. She was forced to choose between a non-viable pregnancy or a trip abroad. She opted for the latter, and in June 2016, the UN Human Rights Council ruled that the country's abortion regime exposed her to "cruel, inhuman and degrading treatment" and called on the Irish government to reform its laws. Well, voters in Ireland had their say. 1; who would have voted for the repeal of the law – is imminent by other abortion lawyers who cover the whole Day over in Dublin. Dr. Ruth Cullen, a spokeswoman for the anti-abortive LoveBoth campaign, admitted defeat on Saturday before the countdown ended. Clare Comran was at the Count, watching as all constituencies in Dublin were overwhelmingly declared to lift the amendment, including an area that voted yes 78.5%. Comran said she had always hoped that Ireland would make the "leap forward" and recently noticed a shift in national attitudes. The Irish are "really ready to make progress and to trust themselves". 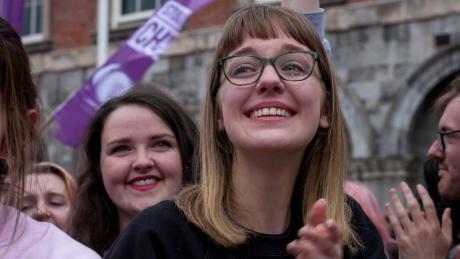 "It feels very nice to get familiar and feel like a whole person in my country, I've never had that in my whole life as an Irishman," she said, adding that she was grateful for the preparation Women's rights activists had done so to arrive at this moment. Ailbhe Smyth, a longtime activist and co-director of Together4Yes, the national pro-repeal group, is one of those women. 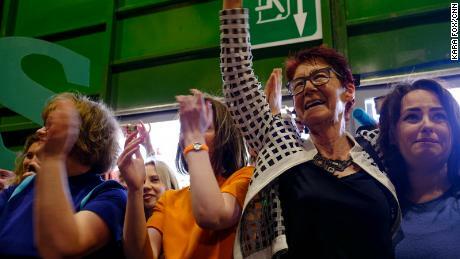 When she came to the Counts, she was greeted with applause by the followers, who thanked her for her many years of effort. Smyth told CNN that the road to that day had been a long and hard road, but the result marked a seismic shift for the country. 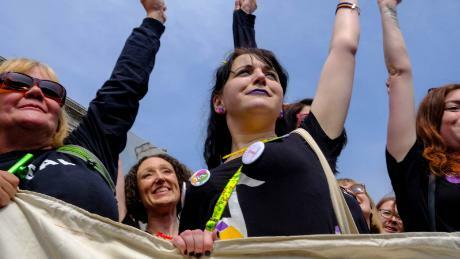 "The Irish stand up clearly and, of course, say that the lives of women in Ireland are important, and it's a great victory for equality of freedom for the dignity of human rights, not just for women," said Smyth. Mark Hickey, a non-voter, observed the count with two other anti-abortion activists and did not celebrate. "The truth is not determined by the general consensus," he said. "We will look back on that moment in history as very gray." Legislators are expected to vote on laws that provide for termination of pregnancy during the first 12 weeks of pregnancy – and later in cases of risk. It is not expected to end the life of the mother or the fetus of the year will survive. 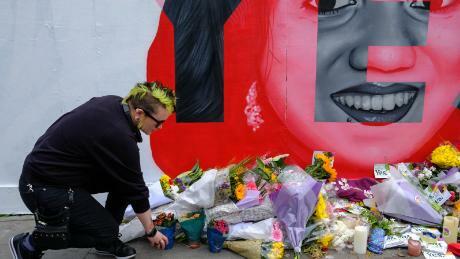 Not far from the polling station, the mural painting of Savita Halappanavar, a 31-year-old woman who died of a septic miscarriage in Galway in 2012 after being denied abortion, was darker. John Howard, 28, brought a bunch of flowers to the place. "Your story was one that captured the realities of what the Eighth Amendment means in a material, tangible way," he said. "It has taken a woman's life, her memory is a bit of an avatar for change – and the direction we would like to have in Ireland – her story includes what we never want to see again and hopes that everything can change be made in their honor. " Others have left notes. One of them read: "If I have a daughter, I will call her Savita after you." "Irish abortions happen; they just do not happen on Irish soil. By the late afternoon, thousands of supporters had gathered in Dublin Castle, where a festive atmosphere developed among a crowd of all ages. 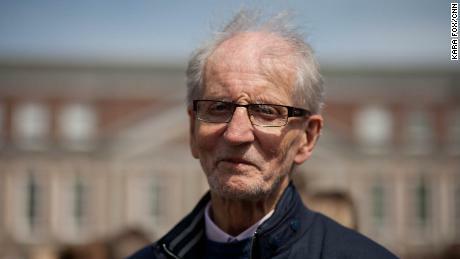 Brendan Lynch, 81, stood between a group of young people who drank champagne and a mother whose children had fallen asleep in their stroller. He said that he was Happy Ireland had distanced itself from its past in which the Church "dominated everything". He acknowledged that he was an outlier in his age group and nodded to RTE surveys showing that voters 65 and older were the majority majority for no. "I never thought I would see this day," he said. "I am absolutely happy, and I regret all the women who had to go to England to do abortions, but now these times are over." Moments later, a choir exchanged classic rock texts for feminist rhymes as a group of women passed by in angel costumes. When the final result came in, the sky opened briefly. An Irish mist splashed over the crowd, but the mood was not muted. Voter turnout on Friday was 64.13% – a record high. The country's Referendum Commission said 1,429.98 (66.4%) voted in favor of the amendment and 723,632 (33.6%) voted against it. Emma Gallagher, 22, cried shortly after the referendum. "I feel safe now, I feel good," she said. "It felt like women did not play a role for a long time … now we know we are important." Next to her was Rene Wogan, a 66-year-old woman who said she had not taken part in the referendum in 1983 – – the abortion ban was included in the constitution – for fear of becoming speak out against the cultural norms of the time. Wogan said that this time is different and Gallagher's hand is solidary. "It was all for justice," she told Gallagher. "You carry the flag for women on." Ireland's Prime Minister Leo Varadkar said in a press conference that a "silent revolution" had taken place. A crowd of about 5,000 followers roared in the square, "We did it."